Freshen applications by animation. Fill applications by sound. Durable operations with the data, complex calculation or generation of the big report will pass little bit faster for the end user if you accompany their by animation and by sound ! * Playing in Background process. Assign to any event in your program a characteristic sound (WAV) for this event. 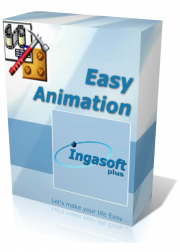 EasyAnimation is limited to simple AVI files. This means the EasyAnimation supports animation clips that are uncompressed or RLE8 compressed, have a color table, contain a single video stream, and have no sound.